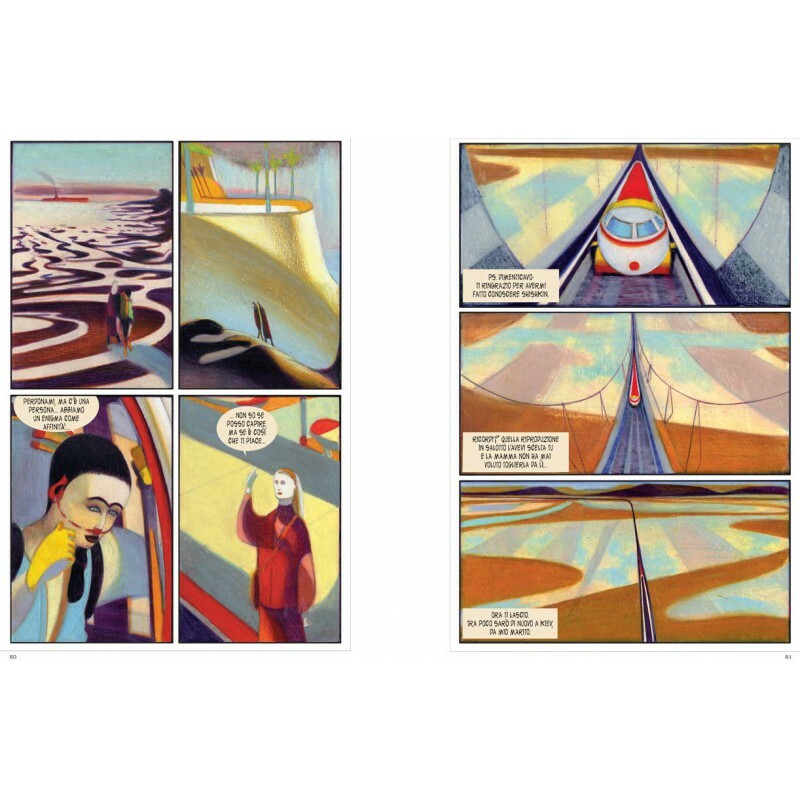 Six short stories developed through Lorenzo Mattotti’s visions and the crystal-clear texts by Lilia Ambrosi and Gabriella Giandelli. Six unusual ‘letters’ sent from an estranged dimension where people are able to reflect upon their lives and relationships, in the end, questioning the meaning of being humans. As in L’uomo alla finestra, these short stories delicately bring to light our frailties and our constant effort to stick to feelings, illusions, and memories in order to keep hold of a life which always seems to be on the verge of getting out of hand. The first and longest story of the volume, “Dopo il diluvio” (“After the Deluge”), is about a woman who is stuck at the airport by a strange accident, unsettling and fascinating at the same time: an invasion of vermillion crabs, so numerous as to transform the runway in a red self-propelled surface. While waiting to leave, she runs by chance into a stranger, who tells her about his difficult love for his ailing wife. Their love gets stronger when they are apart, and the same thing seems to happen to what the protagonist feels for her lover. The second story, “Il ritratto dell’amore” (“Portrait of love”), is just 2-pages long and deals with a painter who is no longer able to paint his partner, since she has stopped loving him. “Lontano, molto lontano” (“Far, far away”) follows the path of a mysterious statuette, handed around by different people, and representing freedom, and all the dreams, hopes and passions that every one of us struggles to preserve, going through the different meanings of the title of the story (a place where you can start a new life or hide, but also a place where the person you love disappears or where the mind of somebody who has lost everything can fade away). 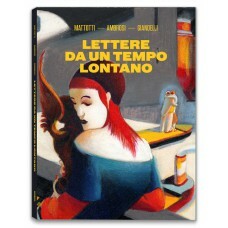 “Lettera da un tempo lontano” (“Letter from a distant time”) is a story set in an aseptic and artificial future world: a young woman, travelling on a train heading to Kiev, writes to her great-grandfather who was a cartoonist, possibly Mattotti’s alter ego, to tell him what has become of that future world he once used to try to figure out through his drawings. “How could they enjoy those odourless, motionless and soundless images” the woman wonders as she watches a video of an old comic book; and maybe that’s the same question Mattotti asks himself while considering his own work. 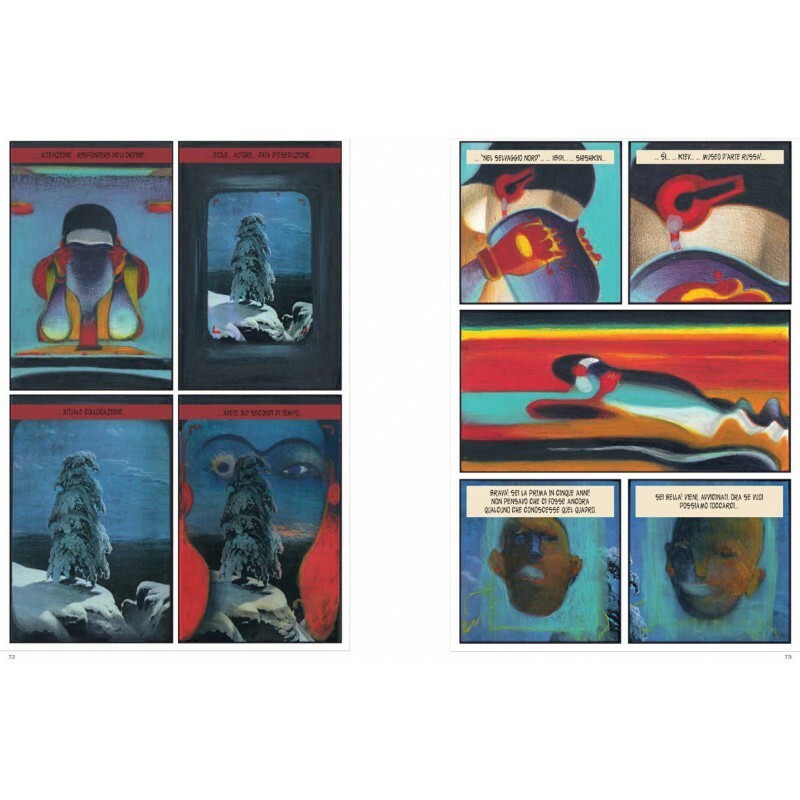 Two further episodes, which were not included in the first edition of the book, close the volume: “Il richiamo” (The Call), whose protagonist is a woman going back to her hometown to visit her sister and her nephew, and the short and evocative “Storia blu” (Blue tale), which in four wordless tables captures all the magic of a fleeting encounter. This book was published for the first time in Italy in 2006 by Einaudi, in the “Stile Libero Extra” series, and was featured in the 2009 volume dedicated to Mattotti, in the series “I Maestri del Fumetto”; #logosedizioni is reprinting it as the fourth chapter of a project revisiting all Mattotti’s artistic experience as a comic strip artist. With the publication of Ghirlanda , winner of the Gran Guinigi Award 2017, Mattotti was back to comics after almost fifteen years. To celebrate this return, #logosedizioni launched this collection in March 2018 with L'uomo alla finestra, (The Man at the Window), followed by Stigmate and Caboto. The fifth title, La zona fatua (The Fatuous Zone) will be published in October 2019, followed by Il signor Spartaco (Mr Spartaco), Labirinti (Labyrinths), Chimera, and Doctor Nefasto. These volumes are presented with a new layout and in a larger format, accompanied by unpublished contents. Lorenzo Mattotti lives and works in Paris. After his studies in architecture, he started off in the late 1970s as a comic strip artist and in the early 1980s created the Valvoline collective together with other artists. In 1984 he published Fires, which was welcomed as a great event in the world of comics and won several important international prizes. From Incidenti to Stigmate, from Signor Spartaco to Doctor Nefasto, L'uomo alla finestra and several other titles, Mattotti’s work has evolved consistently and, at the same time, with the eclecticism of an artist who is always in search for new territories to explore. Today his books are translated all over the world and his illustrations are published in newspapers and magazines such as The New Yorker, Le Monde, Das Magazin, Süddeutsche Zeitung, Le nouvel Observateur, Corriere della Sera and la Repubblica. Mattotti re-interpreted the creations of the most important fashion designers for the magazine Vanity, and in 2010 designed all the covers for the architectural monthly magazine Domus. He has illustrated several children’s books, such as Pinocchio by Collodi and Eugenio, that won the Grand Prix of Bratislava in 1993, one of the most important awards in the field of children’s publishing. Mattotti’s works were featured in many solo exhibitions, such as the anthological expositions at the Palazzo delle Esposizioni in Rome, at the Frans Hals Museum in Haarlem and, more recently, at the Musei di Porta Romana in Milan. Mattotti has created posters, covers and advertising campaigns: he designed the posters for the Cannes Film Festival in 2000 and for the Estate Romana. Among his most recent publications: Jekyll & Hyde (NBM Publishing, 2003) and The Crackle of the Frost (Fantagraphics, 2003) and, at the same time, I manifesti di Mattotti (2002) and Angkor (2003) for Nuages; in 2008, Appunti sul paesaggio for Tricromia and Le avventure di Pinocchio in the Einaudi series “I Millenni”; in 2009 Hänsel e Gretel for Orecchio acerbo/Gallimard, whose amazing illustrations complete Neil Gaiman’s texts in the English edition. In 2010, a collaboration with Lou Reed gave birth to The Raven (Fantagraphics Books, 2012). In 2004, he created the segments between the three episodes of Eros, a film by Wong Kar-wai, Steven Soderbergh and Michelangelo Antonioni. In 2007 he made one of the six episodes of the collective animated film Peur(s) du noir. In 2011, he worked at the animated sequences of the movie by Charles Nemes, Il Etait une fois... peut-être pas and, in 2012, he created backgrounds and characters for Pinocchio, an animated film by Enzo D’Alò. In 2012, #logosedizioni launched the series “Works”, a systematic publication of his illustrations: the first volume deals with pastels and second one is a tribute to the fashion world. In 2013, #logosedizioni released also the visionary work Oltremai, which was exhibited at the Pinacoteca di Bologna. In 2014 he created Vietnam, for the “Travel Book” series by Louis Vuitton. Constantly searching for a language that can go beyond the existing boundaries, the assorted works of Mattotti have been exhibited in Sconfini, and the exhibition catalogue has been published by #logosedizioni in 2016. In 2017, Mattotti collaborates again with Jerry Kramsky, creating the new graphic novel Ghirlanda (#logosedizioni), an epic story that carries the reader into a magical journey. Ghirlanda wins the Gran Guinigi Award at Lucca Comics & Games in 2017. 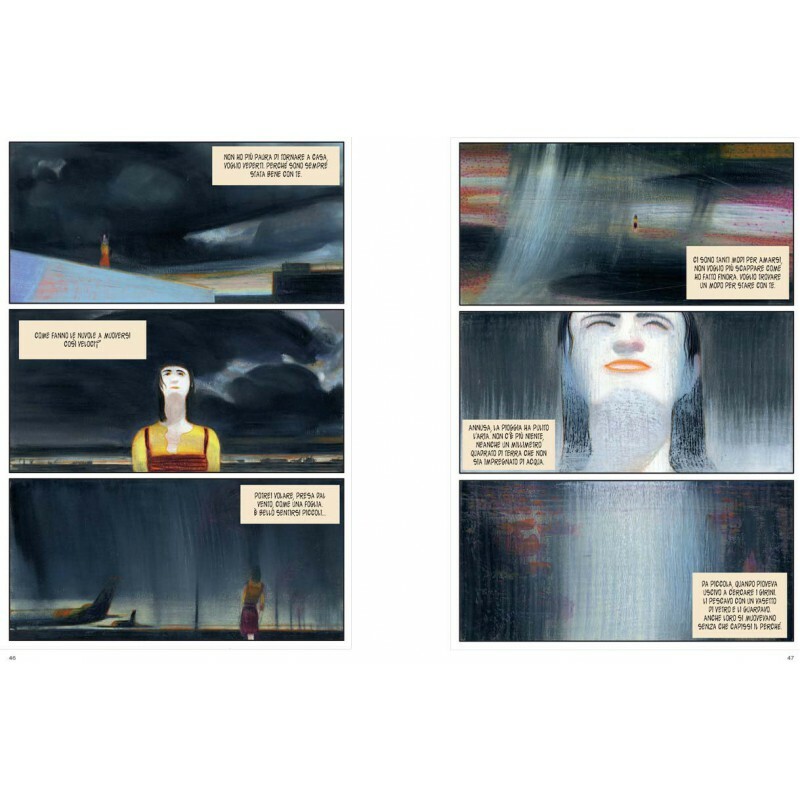 Mattotti’s universe by now seamlessly ranges over comics, painting, illustration and film animation. His books for #logosedizioni are: La stanza, Mattotti Works 1, Oltremai, Stanze, Venezia - limited edition, Venezia - Scavando nell’acqua, Mattotti Works 2 - Moda/Fashion, Nell’acqua, Oltremai - trade edition, Sconfini, Ghirlanda, Blind ,Covers for the New Yorker, L'uomo alla finestra, Stigmate,Caboto and Lettere da un tempo lontano. Lilia Ambrosi was born in Trieste in 1957 and, after studying at the Liceo Classico, she graduated in Foreign Languages and Literature. She moved to Milan, where she lived for moreover ten years working in the publishing, in particular for an Arab publisher of children books. She wrote several manuals and translated many volumes. She edited texts and screenplays for different illustrators whose works have been published in Italy and abroad. In Bologna, she joined the editorial staff of the culture and comic magazine Dolce Vita, headed by Oreste del Buono. In Milan, she taught Italian to foreigners, and, back to her hometown, she collaborated with the regional division of Radio RAI dealing with books and wrote for the Trieste daily newspaper Il Piccolo, about art and books. For moreover ten years she has been collaborating on a regular basis with the Illywords magazine, interviewing great writers. Nowadays she continues translating and teaching English in high schools. Gabriella Giandelli was born in 1963 in Milan, where she lives and works. She got a degree at the Art Institute, at the School of Comics, and then at the Centro Civico di Cinematografia (in directing). 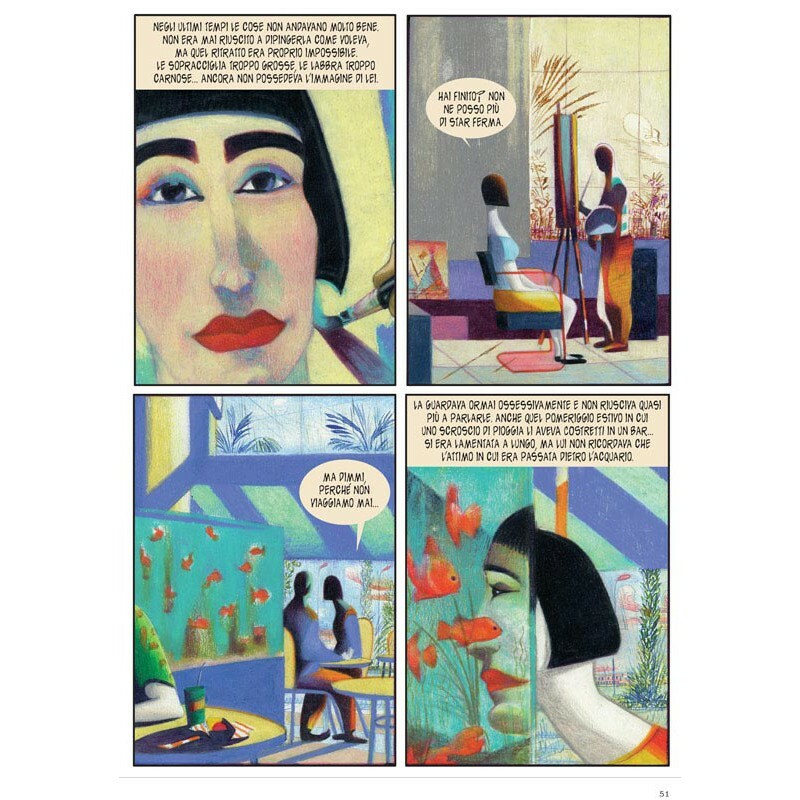 She started publishing her first comic strips in the 1980s, in Italian magazines such as Frigidaire, Alter Alter, and Nova Express, and to this day her graphic novels are translated into several languages and published in Europe and in the United States. She illustrate books for children and she has created the character of Milo the rabbit, for a series of children’s books published by Mondadori, in 1999 and 2000, which to this day became an animated series broadcasted on France5 and Rai3 (she is also the art director of the series). Her illustrations have been featured in many books by various Italian and foreign publisher such as Seuil, Actes-Sud, Einaudi, Minimum Fax, and Mondadori, and in newspapers such as il manifesto, le Monde, and Il Sole 24 Ore. She collaborates with the weekly magazine Internazionale and creates illustrations for the culture section of the newspaper la Repubblica. Her works have been exhibited in many galleries and museums in Italy and worldwide, recently at the Bologna Squadro gallery, in 2018, and at the Helsinki Comics Festival, Finland, in 2016. She has created many graphic design projects, advertising illustrations and took part in the creation of animated movies; since 2000 she has also been teaching comics and illustrations.